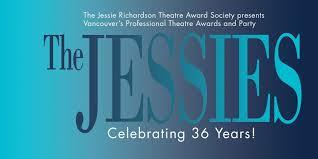 After many years at the Commodore Ballroom, the Jessie Awards returned to a theatre setting to celebrate the best of Vancouver’s thriving theatre scene. Hosted by the fabulous drag duo and Zee Zee Theatre directors Peach Cobblah (Dave Deveau) and Isolde N. Barron, the Queen of East Van (Cameron Mackenzie), the evening was diverse, inclusive, and vibrant — an apt reflection of Vancouver’s tight-knit theatre community. The Queertet (a three-piece band) were on hand to provide background and your-time-is-up music. Rohit Chokhani, recipient of the Vancouver Now Representation and Inclusion Award, took some time in his thank you remarks to talk about the importance of including diverse stories in our performing arts. While he discussed creative freedom and art that transcends gender, race, religion, and sexual orientation, one audience member stood up and began shouting that Chokhani’s definition of diversity does not include him and his views as he believes in a heterosexual binary of male and female. Chokhani briefly addressed him by saying that he also includes him and welcomes him before moving on to finish his remarks. It was a strange, surprising moment that seemed to stun the crowd. Happily, it was over quickly and there were no more outbursts for the rest of the evening. The Arts Club led the large theatre category with Angels in America, Part Two: Perestroika, Misery, and Hand to God all picking up awards. Rumble Theatre’s The Society for the Destitute Presents Titus Bouffonius dominated the small theatre category with six awards, including Outstanding Production and Outstanding Ensemble. Drew Facey picked up two Jessies for this production for set and costume design, and Stephen Drover won for Outstanding Direction. Drover, recently appointed Associate Artistic Director of the Arts Club Theatre Company, also won the directing award in the large theatre category for Hand to God. The Jessies, and Vancouver’s theatre community, have come a long way. As Arts Club Artistic Director Bill Millerd explained, when he moved to Vancouver in the late 1960s, there were only a handful of professional theatre companies. Today there are 66 companies registered with the Greater Vancouver Professional Theatre Alliance (GVPTA). While the new venue may mark a new era for the Jessie awards, there was also the sense that there is a passing of the torch to a new generation. Chokhani mentioned that it’s up to millennials to pave the way for further diversity and inclusion. John Wright (recipient of the GVPTA Career Achievement Award) talked about the next generation carrying on the legacy of Ms. Richardson who he can remember stitching him into a costume during his first professional show. And Millerd was honoured as he finishes up his final season after over 45 years leading the Arts Club and Ashlee Corcoran begins her tenure. Some things may be changing, but what remains the same is the dedication and temerity of Vancouver’s theatre artists.